8 3/4" diameter, 1/4" thick. Made from a coarser material - similar to the texture of coconut fiber, allows more air to flow through the nest pad so it is excellent to use when breeding in warmer weather, temperatures over 70 degrees. These nest pads will keep the youngster’s cooler and dryer while in the nest. 9" wide, 2 1/2 " high. Easy to clean, use year after year. Holes in bottom for ventilation. Designed not to tip over. Use with nest pads, straw, tobacco stems. Perforated bottom provides excellent ventilation to keep nest and youngsters dry. 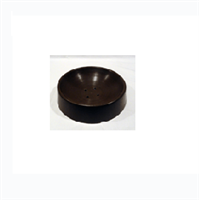 Brown solid plastic bowl with ventilation holes in bottom.